GEOSET » Fire and ice: What makes volcanoes dangerous? Fire and ice: What makes volcanoes dangerous? View Fire and ice: What makes volcanoes dangerous? Some volcanoes are gentle, others inconvenient, and others still, deadly. What makes volcanic eruptions explosive? What happens when volcanoes are covered in ice, as in Iceland or Chile – and what happens when the ice melts? Dr Hugh Tuffen has visited volcanoes across the world – from the long-extinct Scafell Pike in the Lake District to Chile, New Zealand and Japan. As a Royal Society Research Fellow at Lancaster University, he is researching these questions to help predict future volcanic activity. 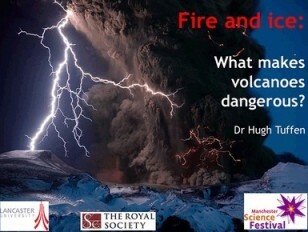 In this talk, he’ll discuss how we understand what makes volcanoes deadly.